Mojave and Sonoran deserts of southeastern California, western Arizona and northwestern Mexico. Sandy desert flats and slopes below 2500 feet. Large, cream-colored, funnel-shaped flowers, 2-1/2 inches wide, bloom March through May. Flowers have 6 petal-like segments, each with a silver-green band on the back. Clusters of these fragrant flowers may be as much as much as a foot long. 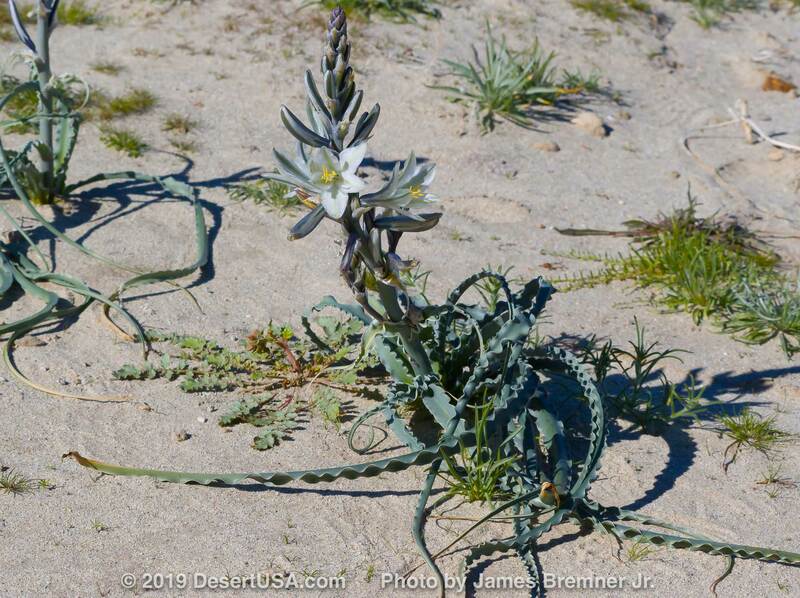 Looking much like an Easter lily, this plant can be easily seen growing along desert roads in the spring. The desert lily has a deep bulb that sends up a stem in early spring that can be 1 to 4 feet high. A cluster of long, blue-green leaves with white margins grows just above the ground. 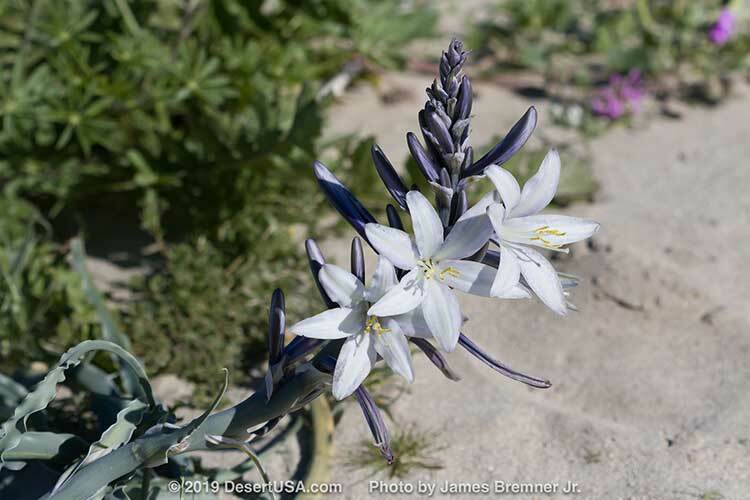 The desert lily's leaves are about an inch wide with wavy edges and grow 8 to 20 inches long. The desert lily was called "Ajo (garlic) Lily" by the Spanish because of the bulb's flavor. Native Americans used the bulb as a food source. These bulbs can remain in the ground for several years, waiting for enough moisture to emerge. 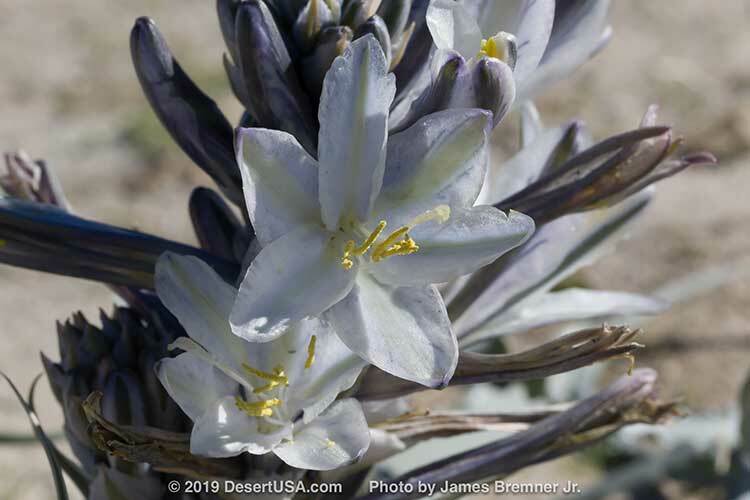 BLM administers the popular Desert Lily Sanctuary, officially designated by Congress in 1994 as part of the California Desert Protection Act which reinforced BLM’s administrative protection of the area dating back to 1968. The Sanctuary is located on State Highway 177, just 7 miles northeast of Desert Center. The best time to visit the Desert Lily Sanctuary is February through April.